No matter how you slice it, and frankly if you possessed Thanos’s gauntlet, which looks like a blinged-out Swiss Army knife on steroids, you could slice it any way you damn well please, physics be damned, Avengers Infinity Wars (AIW) is a monumentally epic film. With a cast of thousands – trust us, there is one scene in Wakanda where this is literally true – every Avenger you could care to name and locations spread across the Earth and the galaxy, this is one blockbuster that truly lives up to the name in every sense possible. Yet for all that bigness, and yes, we’re looking at you Bruce Banner (Mark Ruffalo) in your giant Iron Man-ish Hulk suit, and expansively-imaginative posturing, AIW is not an overwhelmingly bombastic film. That may sound like an impossible claim to make when you consider than not only are the usual suspects in the ranks of the Avengers – Thor (Chris Hemsworth), Iron Man (Robert Downey Junior), Black Widow (Scarlett Johansson), Captain America aka Steve Rogers (Chris Evans), Vision (Paul Bettany), Scarlet Witch (Elizabeth Olsen), Hulk, War Machine (Don Cheadle), Falcon (Anthony Mackie) and newest addition Spider Man (Tom Holland) -but they’re joined by Doctor Strange (Benedict Cumberbatch), Bucky Barnes (Sebastian Stan), the entire Guardians of the Galaxy crew (Chris Pratt as Quill aka Star Lord, Zoe Saldana as Gamora, Bradley Cooper as Rocket, Dave Bautista as Drax the Destroyer, Vin Diesel as Groot and Pom Klementieff as Mantis, and this year’s star of the Marvel Cinematic Universe, Black Panther (Chadwick Boseman). 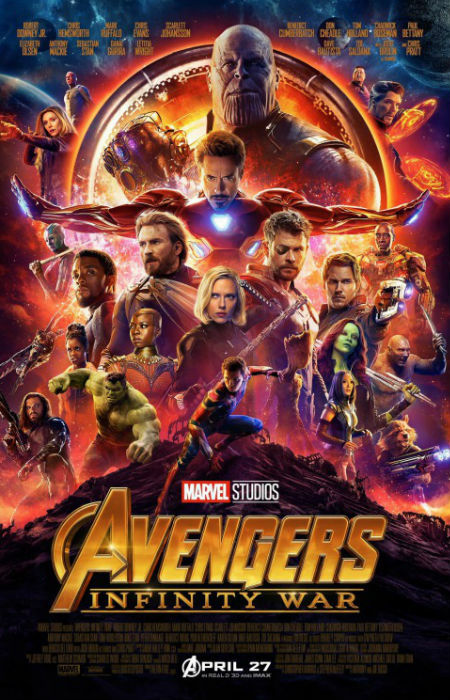 That’s not to mention a cavalcade of other supporting characters who join battle against Thanos (John Brolin) who is after the full suite of six multi-coloured Infinity Stones – they control space, time, reality, the mind, power with one mysteriously called the Soul Stone – which will allow to place with the very fabric of the universe and indeed, life itself. 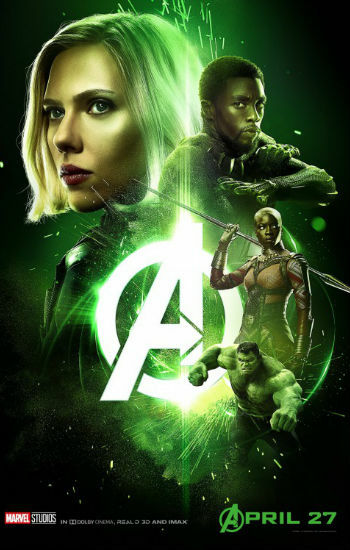 If that’s not a massively expansive premise for a film with a gargantuan cast to match, I don’t what it is; the thing is, Anthony Russo and Joe Russo, working to a superbly-calibrated script by Christopher Markus and Stephen McFeely have managed to imbue the spectacle, and AIW is as spectacular as they come just about every second of its 150 minute-running time, with an inherent intimacy that brings things down to a very human scale indeed (even when the characters aren’t very human at all). AIW would have been a memorable movie regardless, but imbued with raw, heartfelt emotionality, the kind that leaves you gasping for breath with its ability to strike at the very heart of your soul, and there are a number of scenes that do just that, it becomes that rare beast indeed – a blockbuster that just doesn’t look the part, but it feels it every stone-gathering step of the way. Essentially a race to stop Thanos, an oversized member of a race of superhumans who made Saturn’s moon Titan their home, from gathering up the elemental stones forming during the Big Bang, AIW devolves itself into a series of gripping, and oft-times very funny (yes you can laugh while the fate of the world lies in the balance in case you’re wondering) set pieces that take combinations of the Avengers and associated superheroes and friends including Nebula (Karen Gillan), Loki (Tom Hiddleston) and Doctor Strange’s Wong (Benedict Wong) and use them with devastating effectiveness. For instance, on Titan Doctor Strange, who you might recall, wears the green Time stone in a spell-protected amulet around his neck, joins forces with Iron Man, Spider Man, Quill, Drax and Mantis in an attempt to stop Thanos’s children, as he terms his minions, and then Thanos himself, from gaining the power to play with the universe at will. 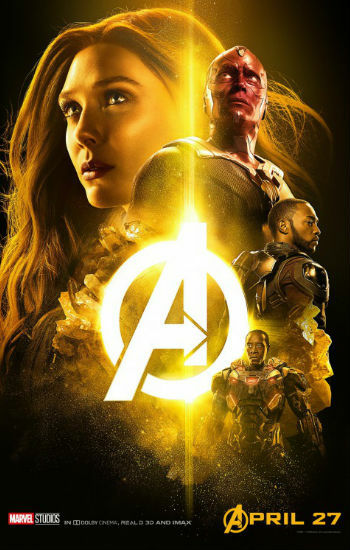 Similarly in Wakanda, where some of the Avengers go to gain help in removing the Mind Stone from Vision’s head – the plan is to save him and destroy the stone in the process – Steve Rogers, Scarlet Witch, Black Panther (with Okoye, played by Danai Gurira at his side), Bucky, Bruce Banner and others stage a titanic battle against Thanos’s mindless attack monsters, of which there are many (hence the thousands). In every smaller construct, all of which are, of course, linked into the grand, awe-inspiring spectacle that is AIW, the narrative is big, bold and the stakes equally as massive; and yet for all the grandness, vastness of scale and diabolical implications on a galactic scale, the film feels like an intimate exploration of raw, unfiltered humanity, friendship, love and belonging that infuses every momentous act with rich, vibrant meaning. This is not a battle just to have a battle – it actually feels like it means something, beyond the usual blurry good versus evil trope which is always inspiringly vague, long on noble sentiment but short on actual specifics that you can wrap your head around. AIW brilliantly fills in those blanks, taking a grand, epic fight for the soul of the universe, and the sense that everyone and everything has a right to exist, and giving it an accessible truthfulness that resonates in ways that will grab at your heart and hold it tight until it explodes. Can that actually happen in a big, bold, brassy blockbuster? It can, and it does, helped along in no small part by a villain who is no pushover and actually makes the Avengers, who are more fractured than you might expect, work for their heroic money. Refreshingly, Thanos, far from being the un-nuanced bad guy that films like The Avengers (2012) and Guardians of the Galaxy (2014), actually has a heart of sorts, though Gamora would likely argue – his scene with her is far more touching than you might first imagine – a moral code, skewered and twisted by some pretty hateful reasoning, and a determined sense that the universe needs him to restore balance. It all sounds rather noble in one sense, but when you realise, and that realisation is pretty quick in coming, that its tainted by an absolute lack of anything even approaching humanity, an extremist eco-terrorist mentality that beats more than a passing resemblance to Nazi ideology, he becomes a true, full-fleshed out villain, a complicated being who is not simply thuggishly powerful but possessed of the reasoning to execute on that in ways that the Avengers don’t always see coming. To say anything more than that would be to reveal major spoilers upon major spoilers, and there are a multitudinous lot of them spread through AIW including a devastating ending that sets things up beautifully for next year’s Avengers film, but suffice to say, Thanos is not your usual easy knockover Marvel villain, the Avengers do not have it all their own way, in fact for much of the time they are well and truly on the back foot, and AIW is not simply logistically complex, but narratively and emotionally the biggest superhero film to come along pretty much ever. In an age where hype is practically a religion, and bombasticness a near-permanent state of being, AIW more than lives up to its status as this year’s blockbuster to beat, a neck-craningly giant film that somehow manages to be both small-scale impacting and just-so funny, and the most raw, emotionally-in -your-face piece of cinematic storytelling you’ve seen in a while.